Lots of marketers will tell you that the key to modern advertising is to be less interruptive—inviting viewers into experiences that feel more like entertainment and less like bombardment. 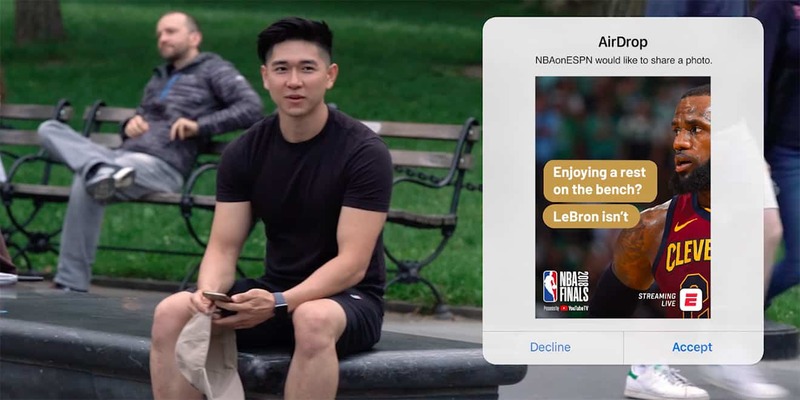 But a new campaign from ESPN and agency R/GA decided to go hard the other way, finding and surprising people with individualized messages that seemed to appear on their phones as if they’d been spotted by the all-seeing eye of advertising. The stunt, aimed at driving viewership of the NBA Finals, hinged on Apple’s often-forgotten AirDrop feature, which—if enabled, which it often is—lets two users transfer files directly between iPhones and other devices, if they are within roughly 30 feet of one another. In a devious little trick, the marketing team sent personalized messages to innocent bystanders who were doing just about anything except watching the finals. Sitting on a bench? Boom, NBA finals. Looking at a fountain? Why not the NBA Finals? Part of a broader campaign under the tag line “You Seeing This?” (also including TV commercials and various digital ads), the AirDrop stunt was done on a small scale in five downtown NYC locations, for “learning purposes,” according to ESPN. To be sure, the case study clip should be taken with a grain of salt—such reality-style stunts tend to include at least some measure of staging, and it’s not clear how ESPN and R/GA would have managed to target specific strangers with specific messages in crowded public spaces (and then chase down everybody involved for a video release form). But skepticism aside, AirDrop trolling is definitely a thing. So now might be a good time to check your settings (hint: Settings > General > AirDrop > Contacts Only).